I hope you are enjoying 2019 so far. Thank you again for your support over the past few years! What are we looking at this January? Claudia Gordon, a native of Jamaica West Indies, graduated with honors from Howard University in Washington, DC in 1995 and went on to complete law school with honors at American University’s Washington College of Law in 2000. She recounts her childhood in the West Indies, her search for identity while grappling with audism in a hearing college, and her ongoing quest to create spaces in society for seldom-heard voices. Claudia Gordon is a Director of Government and Compliance with Sprint Accessibility. We would also love to share an insightful research by RADAID Research, available here. The research confronts a major issue; how can we share dignified images and information on the people and communities we work with and still secure funding or gain traction in our advocacy? How can we do better? We would love it if you could take a few minutes of your time to complete our Survey HERE . Your feedback is invaluable to help us to improve Embrace Everyone for better impact. Many thanks! Today on this Human Rights day (10 December) we marked the 70th Anniversary of the Universal Declaration of Human Rights. The day also marks the end of the 16 days of activism against Gender Based Violence. How are we tracking on all these? And a simpler question, what has impacted you the most during these last 16 days? We will share a few posts that have resonated with us. An interview by Dr Mercy Korir and persons with vitiligo in Kenya (KTN News). What struck us was how open and vulnerable the young people were in responding to the questions raised, and how society has shown rejection rather than inclusion and acceptance. We can be better, do better. 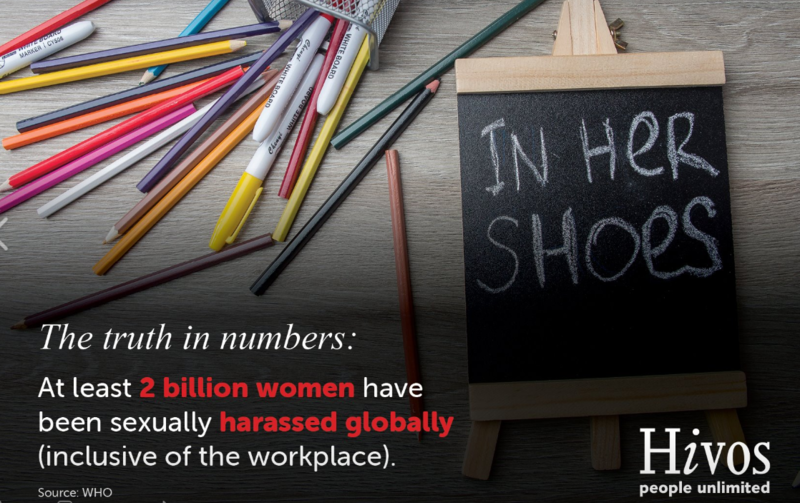 The #In Her Shoes# campaign by HIVOS East Africa on Ending Gender Based Violence. The images were vivid and spoke loudly. Below are two images from the campaign. Over the next few days we will be marking two pivotal days; the World AIDS day today and the International Day for Persons with Disability (IDPWD) on 3 December. These will happen concurrently within the 16 days of Activism Against Gender Based Violence that runs from 25 November to 10 December every year. World AIDS Day:Today marks the 30th anniversary of World AIDS Day, set to raise awareness about HIV and the HIV epidemic. UNAIDS notes that 940,000 died from AIDS related illness in 2017, despite advances in medical treatment. This represents a 51 per cent drop from its peak of 1.9 million in 2004. There are currently 36.9 million people living with HIV around the world, 1.8 million of whom are children aged under 15 and another 1.8 million who are newly infected every year. Of this, 21.7 million are currently accessing antiretroviral therapy which is up by eight million since 2010, an indication of increased awareness and more proactive testing and treatment. The International Day of Persons with Disability (IDPWD) is marked annually on 3 December. The theme for 2018 is ‘Empowering Persons with disabilities and ensuring inclusiveness and equality’. The focus of the theme is on inclusive, equitable and sustainable development envisaged in the 2030 Agenda for Sustainable Development (SDG). Finally as we mark these days, the concept of intersectionality comes up. The Intersectional theory asserts that people are often disadvantaged by multiple sources of oppression: their race, class, gender identity, sexual orientation, religion, and other identity markers. Intersectionality comes up as we mark these days, because evidence shows that women with disabilities are more vulnerable to gender based abuse and at higher risk of exposure to HIV and AIDS. Persons living with HIV or AIDS are also at risk of disability on a permanent or episodic basis as a result of their condition. Disability is not inability. Disability is only in the mind. Do not call me disabled but a woman living with a disability. Do not call me visually impaired, I prefer being called blind. Disability is the interaction of impairments with the environment and people’s attitudes. These are some of the many positions people hold on the subject of disability. As a woman with a disability myself, I understand some of the challenges we face as a community and how we wish the rest of the world would interact with our disabilities and us as hosts of such disabilities. However, it is increasingly becoming obvious that ‘disability’ feels like a bad word and people are trying their hardest to disassociate with it. First of all, in my view, from my lived experience no one can voluntarily elect to be disabled. There is absolutely nothing advantageous about being disabled in my view. Borrowing from the school of thought that disability is the interaction between an impairment, the environment and people’s attitudes I wish to paraphrase that indeed a disability is a limitation or a host of physical, health and/or mental limitations at a personal, environmental and in the interactions with people level. That collation of disadvantages to me is why I am of the opinion that nobody would voluntarily elect to be disabled because a disability is a key to all kinds of disadvantages more so in some forms, spaces, economic groups, genders etc. However, the bone of contention with disability has always been about mankind’s feelings about disability and how those feelings spill over to the treatment of the host of the disability. I applaud the schools of thought that have done tremendous work in bringing us to today’s terminology of people living with disabilities because it is important to distinguish how we view disability and how we treat the hosts. By and large, disabilities negatively impact people’s lives and it is fine to be wary of that. It is fine to make efforts to prevent disabilities if we can. But how do we separate our contempt for disability, for lack of a better word, from the host? How do we positively have dialogue about the ills of disability without injuring the host? How do we attempt to manage disability without inferring we feel the host is a burden and throw them in a depressive mode? How do we encourage positive self-image of a disability host without pressuring them into a radical divorce from ‘disability’? So why does it sometimes feel like disability is a bad word? Why are people with disabilities made to feel like besides trying to adapt to realities of living with a disability they must always endeavour to wash themselves clean of any association with disability? Why do we seem to be pushing mantras like a ‘disability is only in the mind’. Or the only disability is a bad attitude.’ Some people would go as far promoting the idea that it’s possible to have a disability but not be ‘disabled’. I applaud those who are disabled but declare they do not see themselves as disabled. If that thinking is empowering for them that is fine except when it starts becoming the gold standard of living with a disability. When it creates the impression disability is an attitude. In my view, that is condescending. Disability is as real as daylight. The environment and people’s attitudes do play a very significant role in how it impacts someone’s impairment. As someone who is physically disabled, my environment plays a big role on how mobile I can manage to be. How independent I can be. And people’s attitudes toward my limitations similarly influence the scope of impact of my impairments on my life at large. What never goes away is the impairment. I am still physically challenged and that impairs me and at times, drains me too. I cannot psych myself out of that truth. Surely, my attitude too plays a big role but only to endure it. Not make it disappear. After a long day of endurance in my wheelchair I will go home and still face the pain of subjecting my impaired body to long hours in the wheelchair coupled with the impacts of transfers, bumpy roads etc. No amount of positive thinking, support system and modified assistive devices can take that away completely. Therefore, unless I can jump out of my wheelchair, walk and have every impaired bit of me restored, my disability just doesn’t disappear based on my own attitude, public attitudes and environmental adjustments. All these things help but only to reduce the scale of impact of the impairment on the lives of people with disabilities. I wish I could say I am proudly disabled. To me there is nothing to be proud or ashamed of by virtue of being disabled. I have limitations that I did not consciously seek. It just is the way things are. 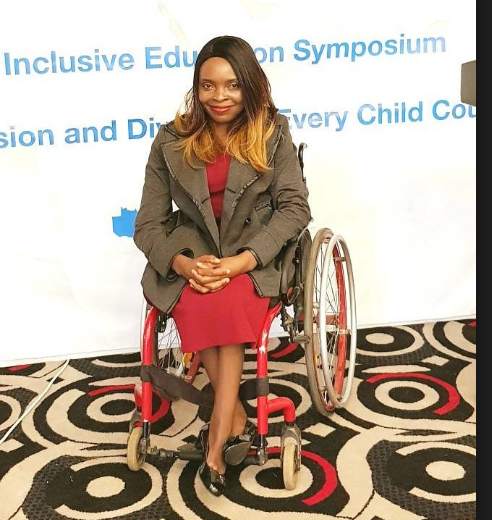 I, Georgina Mumba, am a host of paraplegia. I host the impairment and the consequences that come with it. How I adapt to this reality is a whole other conversation. How society treats me as a host of my disability is, too, another conversation. What I take pride in every so often is the victories I realise in my quest to make the most of an unfortunate reality. I celebrate my achievements in spaces where my disability significantly negatively influences and in those times I prove wrong those with unhealthy attitudes towards me as a host of a disability. So, is disability such a bad word that we must fear being associated with it? Should disability be used as a shaming word? What is the policy on successfully living with a disability? How can we allow people to acknowledge themselves and their disabilities without making them feel anxious about how that speaks to their attitudes? How do we not make people with disabilities feel our acknowledgement and celebration of their being and efforts are strictly dependent on their radical divorce from disability? This is not to mean there is nothing to be said about healthy and unhealthy attitudes towards management of a disability. The universe clearly hands some crappy cards but that does not mean we must throw our hands in the air and throw away even the little we can do with our abilities. That part is in one’s best interest as it is in the general community’s. As a woman with a disability my challenge in life is, I often wonder how well am I managing my disability and how well am I doing just as a human being? Every so often there is a video, a link or just a reference about an inspirational disabled person and I wonder if I am adapting as successfully as those of our celebrated colleagues? I hear of people who used their disability as impetus to shatter in numerous glass ceilings and I wonder what we think of those whose limitations are exactly the very barriers determining the ceilings of their dreams? Is disability really an attitude? Or that in itself is a disabling attitude? Today we mark the World Mental Health Day with the theme ‘ Young people and mental health in a changing world’. The expanding use of online technologies undoubtedly brings many benefits but also additional pressure. In addition, a significant number of people live in areas affected by humanitarian emergencies such as conflicts, natural disasters and epidemics in addition to widening inequality and poverty. WHO notes that half of all mental illness begins by the age of 14, but most cases go undetected and untreated. Among adolescents, suicide is the second leading cause of death followed closely by depression. Today we profile a Ted Talk by Ghanaian born entrepreneur and lawyer Sangu Delle entitled ‘There is no shame in taking care of your mental health’. He seeks to demystify and highlight the stigma against mental health issues in most of Africa and especially among men that will make them shy away from seeking intervention. He notes the ‘need to realise that our mental struggles do not detract from our virility, nor does our trauma taint our strength. We need to see mental health as important as physical health. We need to stop suffering in silence. We must stop stigmatising disease and traumatising the afflicted’. 3. 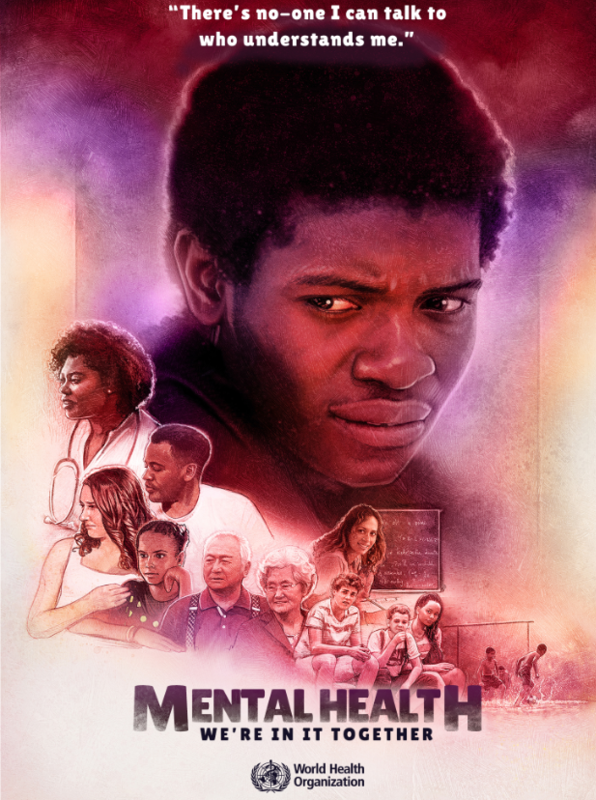 I am also honoured to share a previously shared article by the Zambian based disability inclusion advocate Georgina Mumba that is available here with the title ‘Disability and Mental Health: A burden too heavy to bear‘ in which she draws the link between mental health and disability. ‘ mental health is a real challenge for persons with disabilities as they grapple with the challenges of their impairments, some of which include health complications, and issues of disability. Stigma, exclusion, isolation, abuse etc are challenges that are sometimes more compounded in our homes and communities than in institutions where persons with disabilities do not only have each other for support but also sometimes have access to professional help. The bottom line is we are all part of the problem until we start being part of the solution’. Happy September! We love to not only share articles that touch on equality and social inclusion, but to also highlight opportunities (webinars, online courses, events etc) that you dare not miss and which touch on various aspects of inclusion. 1. 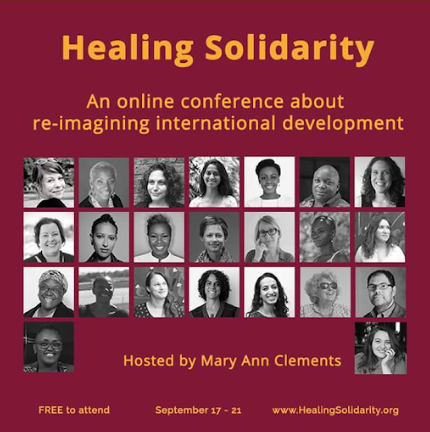 The Healing Solidarity: Re-imagining International Development –online conference (September 17-23). Workers are routinely exposed to traumatic events linked to the cause of mental health issues including depression, burnout and anxiety. Increasingly, work stress including extremely heavy workloads, long hours and limited time for self-care are being highlighted as major challenges. We share recordings of discussions on the importance of action on mental health care and the self care for all workers, and why we should speak more and take action on mental health care in our professional and social spaces. Humanitarian effectiveness and staff wellness by Professionals in Humanitarian Assistance and Protection (PHAP) available here. 3. The Make Change Happen free online course which covers elements including understanding power dynamics, collaboration, opportunity and action that can tackle injustice and bring positive change. Details on the course are available here. 4. Diversity Award by Bond: And last but not least, a call by Bond for organisations that are championing inclusion and equality by actively seeking to redress gender, race, sexuality, age and disability imbalances through employing and developing a diverse, inclusive workforce. These are organisations that are putting strategies and initiatives in place that champion diversity and equality, and hence promoting inclusive employment. If this is you or if you know of such an organisation , then submit the entry for the Diversity Award by 5pm on Friday 28 September 2018. The Global Disability Summit was hosted by DFID, the Government of Kenya and the International Disability Alliance (IDA) on 23 and 24 July 2018, in London, UK. The ‘Charter for Change’ is the official Summit legacy document and is intended to ensure global consensus to address inclusion, and support the rights of persons with disabilities around the world. All organisations and governments are called to sign up to the Charter by emailing ‘yes’ to GDScommitments@DFID.gov.uk. Among the key speeches in the event was one by H.E. Mr. Lenin Moreno Garcés, President of Ecuador who is the first person that uses a wheelchair to be elected as a head of state in Latin America, and an influential figure who has improved rights for people with disabilities on an international and national level. Among other positions, he was formerly UN Special Envoy on Disability and Accessibility from 2013-16. Efforts should be led by people with disabilities, and their representative organisations, in development processes that impact them. Implement international agreements and standards like the CRPD and SDGs. Commit money and resources to inclusion within global financing processes and national budgets. This should factor the universal design principles (whereby no one is excluded from facilities or services because of an impairment). We are also honored to share a profile on Mr Harrison Kariuki, a 28 year old who is currently a volunteer teacher at the Kapsabet School for the Deaf in Kenya, and who is also deaf himself. “I am now a volunteer at the Kapsabet School for the Deaf, because I understand the challenges that deaf people face. I know what the pupils here are going through and I want to act as a role model so they see that deaf people can have a positive future. I love teaching my pupils sign language because it helps me to help them advocate for their rights. You need to be able to communicate with others in order to advocate for your rights, so by teaching sign language, I empower my pupils’. You can read more about Harrison’s work here.